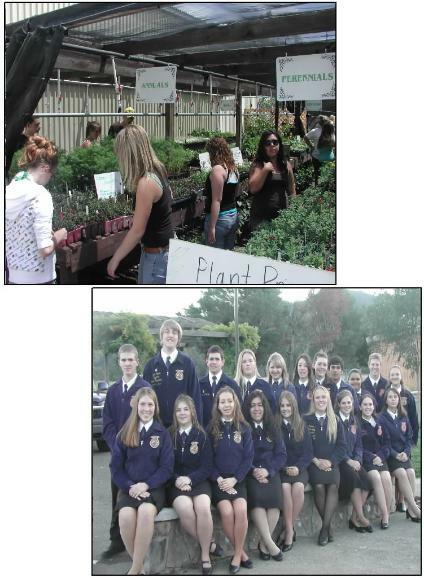 What is offered at your local Agricultural Education/ROP Program?? ROP Floral Design - UC "g" requirement. Meets High School Fine Art requirement. Allows students to apply an artistic approach to floral design, through the floral design industry. Ag Skills - elective credit. Successfully learning how to operate the school farm; using hand tools, electrical tools, plumbing, carpentry, fence building, cement work, heavy equipment, aiding teachers in the classroom, and much more. Introduction to Viticulture - elective credits. Includes history and development of the wine industry, grape growing, distribution, processes & factors affecting wine quality. This course covers biology, anatomy, propagation, cultivated varieties, rootstocks, climate, vineyard practices, and common diseases and pests. Provides knowledge required to establish a vineyard in Lake County. Vineyard Management - Elective credits. This course is designed for students already familiar with the basics of viticulture. A student project will be completed using geological survey data, evaluating a real site for its potential as a vineyard. Students will develop an establishment plan and create a water management strategy based on soil properties and climate of a selected site. A task management plan will be developed for a year including specific strategies for management of weeds, vertebrate pests, insects, and diseases. Lecture topics covered will include canopy management, foliar sampling, sustainable management practices, and how cropping systems affect vine vigor. Ag Science - UC "g" requirement. Introductory course prepares students for subsequent science courses. Emphasis on Earth and Physical Science. Agricultural Biology - UC "d" Lab requirement. Life Science Lab class. Animal Anatomy/Physiology - UC "g" requirement. Exploring anatomical structures and their functions. ROP Veterinary Science - UC "g" requirement. Career exploration in vet industry, including skills & techniques. Ag. Mechanics I - Elective credits. Exploration of basic skills in metals, woods, and welding manufacturing. Rop Metals - Elective credits. Welding, machining, cold metal forming of metals. Manufacturing advanced projects. ROP Woods (Mill and Cabinet) - elective credits. Developing skills in cabinet, case and furniture design. ROP Construction - elective credits. Provides a foundation and exposes students to entry-level job skills in construction. all of these can be counted as elective credits as well. This record book is a member's key to success in the FFA...that is your FFA degrees & awards, access to FFA scholarships, demonstrating your entrepreneurial business skill, and keeping track of your involvement in leadership development activities. http://www.calaged.org/ - this website link is where the SAE Project Electronic Record Book can be found and downloaded. Note: Once you are at this website, click on the FFA & Students link, then click Record Book under the FFA Info tab. In this new screen, click the FFA Record Book link and then click the Download Release 2.0b, saving this Excel document to a USB flash drive. Get the complete Agricultural Education experience!! The National FFA Organization - is a dynamic youth organization within agricultural education, that prepares students for leadership, personal growth and career success. It is a learning tool to strengthen the "Hands-On" part of the high school agricultural education curriculum. Supervised Agricultural Experience Program - Each student is required to plan and maintain a project related to their agriculture program. They are also required to keep records on transactions related to their project (i.e. hours, receipts, expenses). "Learning by doing" part of the curriculum.